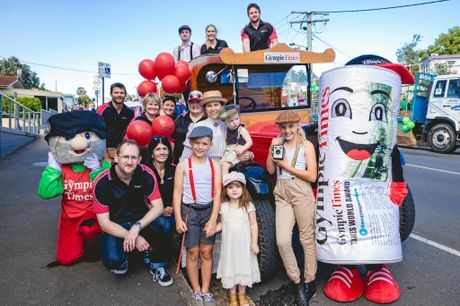 GYMPIE was treated to more fun than you can chuck a nugget at yesterday as the Rush Festival served up a massive line up to celebrate Gympie's 149th birthday. From a vintage car and bike show to a colourful parade down Mary St to a free musical treat in Nelson Reserve, the festival could only be described as pure gold. Classic car-lovers lapped up the display of vehicles in Nelson Reserve from 11am alongside the crowd-pleasing sounds of Rock-A-Billy Band Zed 28. From 3pm, rides, slides and fun activities including face-painting, a climbing wall, laser skirmish, jumping castles and a bungees run, kept families entertained for free right until 7pm. Meanwhile in Mary St the historical Gold Rush parade served up an impressive stream of businesses, schools, sporting clubs and organisations who donned colourful outfits and paraded the packed street to show what they were all about. At 5pm, a spot at Nelson Reserve was hard to come by as a large crowd gathered to enjoy the free concert featuring local Gympie's own Emma Beau and Linc Phelps who warmed the stage before Aussie 80s pop legends Mental as Anything belted out their iconic sound to the packed the park. With such a successful event, organisers are now looking to a bumper Gold Rush next year when Gympie will celebrate 150 years since James Nash discovered gold in Gympie.